Centerline is a core path/region of influence. Centerline is the imaginary vertical line down the middle of your body, and includes many sensitive striking targets that you need to protect. Centerline is the imaginary vertical line down the middle of your opponent’s body, and includes many sensitive striking targets that you would like to attack. Centerline is the imaginary horizontal line of attack and defense from you to your opponent. However, there is more to the story than the who and what. Centerline is more than a line that bisects a space or a line that connects two points. The key word is influence. If your opponent is behind you, is it as important to protect your eyes, nose, and throat? Yet, you aren’t protecting them from a frontal assault. 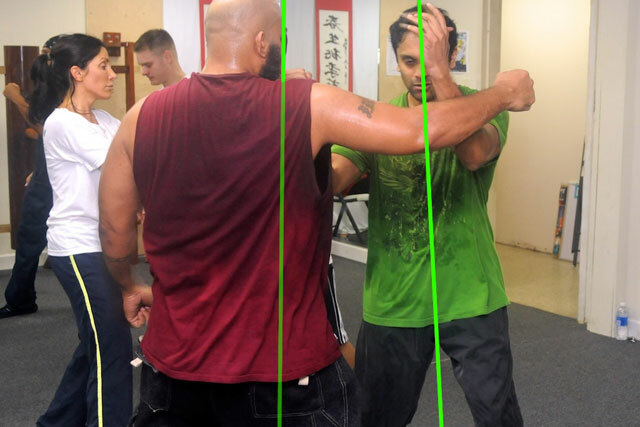 The fight is behind you, and if the opponent is bridged, he is also all around you, as well… Where is the centerline? Or more to the point, how do you protect yourself? Use your hands or feet to attack the rear or side, and if his attacks are reaching around you, attack his his hands and legs (attack the attack). You can bend and move to place yourself in a better position and angle and your opponent in a worse position and angle. Given enough time, you should always turn around to be best equipped to defend yourself. There is no time for mysticism in self-defense. Now if you are facing your opponent’s side. Should you go for the floating rib, side of the face, or go for a hit to the groin or nose? Apply common sense. What’s the answer? The answer is not known beforehand. Where are you? Where are your hands? Where are your opponents hands? What is open for attack? What region do you have the greatest influence. What path can you inflict the most damage in the least amount of time? Training provides you the experience and understand to analyze these factors. When it is all going down you have to fight for your life. Rather than chase the shadow of an idea. Seek the core little idea, and then you will never be off center.